If tried and convicted, Le Pen faces up to three years imprisonment and a fine of up to 375,000 euros ($425,000), although it is unlikely she would receive a custodial sentence. Marine Le Pen made a failed run for president this year. Paris: French far-right leader Marine Le Pen was charged Friday over claims her party illegally claimed millions of euros from the European Parliament to pay for France-based staff. Rodolphe Bosselut said Le Pen had been summoned by investigating magistrates in Paris and that they had, "as expected, charged her", adding that she would appeal. A judicial source told AFP she had been charged with breach of trust over the salaries paid to her chief of staff Catherine Griset and her bodyguard Thierry Legier and for complicity in breach of trust as FN leader. 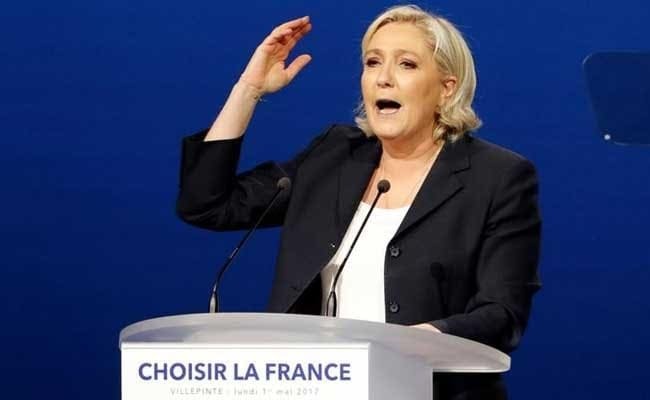 The 48-year-old National Front leader, who made a failed run for president this year, invoked her immunity as a member of the European Parliament in refusing to answer questions from investigators during the campaign. She had however promised to cooperate with the investigation after the May presidential and June parliamentary elections were over. At Friday's meeting with the magistrates, she read out a declaration and declined to answer questions, as allowed by the law, her lawyer told AFP. Investigators suspect the FN used money from Brussels earmarked for parliamentary assistants to pay staff for party work in France. The European Parliament claims it was defrauded of up to five million euros. Griset and another FN assistant have already been charged with covering up breach of trust. Le Pen was first elected to the European Parliament in 2004. She is one of 17 National Front lawmakers -- along with her father Jean-Marie Le Pen, from whom she is estranged, and her partner, FN vice-president Louis Aliot -- being investigated over salaries paid to around 40 parliamentary assistants. The centrist MoDem party, which is allied to President Emmanuel Macron's Republic on the Move party, has been targeted in a preliminary probe over similar allegations involving assistants' salaries. Le Pen, an anti-EU nationalist, beat the candidates of the traditional right and left to secure a spot in May's presidential run-off against Macron, a pro-EU centrist. But she was soundly beaten by Macron in the second round, by 66.1 to 33.9 percent. Her legal woes took a back seat during the campaign to the scandal ensnaring her conservative rival Francois Fillon, whose wife was paid nearly 700,000 euros for a suspected fake job as a French parliamentary assistant. In legislative elections held directly afterwards she was elected to the National Assembly for the first time, winning a seat in the northern former coalmining region of Pas-de-Calais.